Home » Holidays » Too Soon? Is it too early to be talking about Christmas? In thrift stores, you sort of have to buy when you see it and this week my local thrift had put out a ton and a half of Christmas decor. I dug through it all (travel size bottles of Purell are my friend) and only came away with one thing, but it was a doozy. Did every single household of the 70’s have one of these? I think they are sort of in the same category as glass grapes on the coffee table (we had gold ones). My Mom went through a rather brief phase of making ceramics and made a tree very similar to this one. And that’s the type of tree I thought it was at first, but it says Arnel’s on the bottom which appears to be a manufacturer’s name. On ebay these puppies have gone for up to $109.00 recently. I paid $6.96 at Volunteers Of America. Are you starting to love it more now? It’s missing a few of the light pegs which I’ll pick up on ebay, but other than that it just needs a good bath and it’s good to go. I’m already planning where I’m going to put it and how I’m going to make it look as cool as I already know it is. Because I’m really grooving on this tree! So the question of the day is – do you love it as much as I do or is it too way too funky for your taste? I love it & have a similar one that I’ve used every year since the 70’s!! We had one of those too. My Mom also took ceramics. And I also bought some thrift shop Christmas decor this week. Love it. I have more of this type of tree than I care to admit. As in, my family rolls their eyes when I rescue another one. I’ve sold several of them as well. I have so many bulbs that I theme the colors each year! The closer you wait till Xmas the more money you will get for it on EBay. Of course I’m not sure I could part with it if it were me…enjoy! they want that much for them on ebay? I have one in the basement! My Mom got it for my Grandfather after my Grandmother died so he would have a tree. I love it, Pam, and these were all the rage at one time. I suppose it would be considered vintage now. I have one that either my mother or uncle made in the 1970s. I think they are fun. I love pulling mine out each Christmas. You got yours for a STEAL! It’s never too early for Christmas. Think of it as vintage. Also the amount of time and love put into making it. I had my grandmothers but it as damaged. I did pull a large lighted ceramic Santa from my mom’s sale. A friend had made it and she discarded it. I love it. With a tear in my eye, I will tell you that I love it! 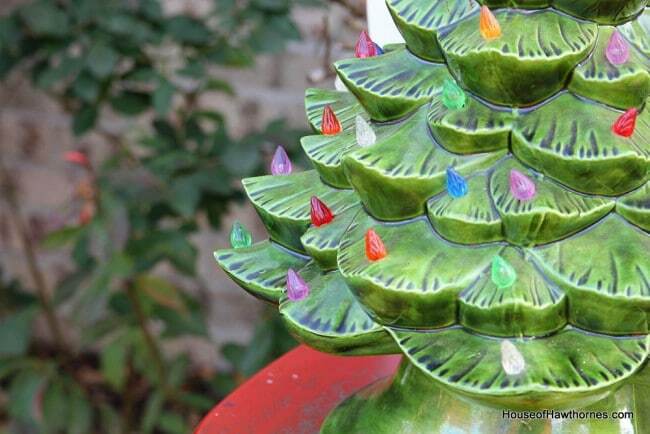 My Gram took a ceramics class when I was a tot, and made all kinds of things — including one of these amazing trees. Makes me feel very sentimental. If I saw one, I would grab it in a heartbeat! I like ’em! Don’t have one myself, but they remind me of people who had them in my past — aunties, grandma — so they elicit warm fuzzy feelings. Good timing! 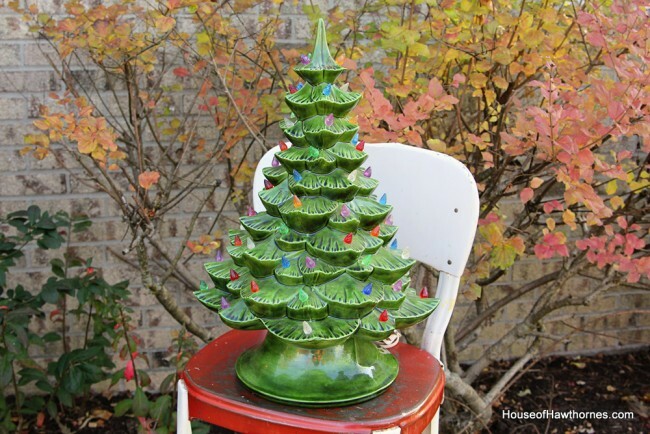 I’m putting one of these vintage ceramic trees in my booth this afternoon. Congrats on your find…great price, too!!! Love it! My Little Grandma had one and we sold it at her estate sale but I’ve been wishing I hadn’t ever since. I’ve looked at them on ebay and etsy and you’re right, they are right pricey. I’m hopeful that I can find one at a price closer to what you paid! Pam, we have one, too ! Mom made it in ceramics class while we were stationed in Panama in the early 60’s. I tried to sell it at the estate sale after mom and dad died, but no one wanted it. I think I’ll dig it out for Christmas !! thank you for walking me down memory lane ! It’s never to early to talk about Christmas! I’m in love with your tree. I remember a couple very similar ones in our home when I was growing up. Brings back memories. Wonder if mom still has her’s – doubt it. But you bet I’ll be asking about it. I’m so happy you reminded me of them. My mother-in-law made me a very similar tree for my bridal shower in 1979. It now resides in our oldest daughter’s house. I had no idea they’ve become such expensive items. I better tell her to be extra careful with it! I remember them. Oh so 70’s. At our GW it would have been twenty bucks. Good deal. We have one exactly like the – I think I got it at the Salvation Army store for $3 last year – it was marked $6 but it was the color of the day and half off. Can’t believe they go for that much on ebay! My Aunt made these ceramic trees in the early 70’s. She gave me and my Mom each one of them. My Aunt and my Mom are gone now, and I have hers, so I put one in each of our 2 bay windows every year. I LOVE them! I guess they are vintage…guess I am too, then! I think it is so cute. I can’t wait to see pictures of the way you display it for Christmas! I think it is wonderful. I am always on the lookout for these trees. Great find. What a great find. I remember these! Cool find! I love it. Can’t wait to see how you stage it. when my mil passed away, I could not part with her tree just like this one!! She made hers, in the 70’s, of course. I too, want to see how you will use it. I have one that my dear departed Nana gave me back in the late 70s, a few years after I was married. I put it up every year, and I just know that she’s with me at that moment. I would never get rid of it – it has a place of honor on my buffet. Yup, it’s early. Oh, my I remember these! I almost made one in ceramic class in the late 70’s. LOL!!! It’s in good shape. Ho, Ho Ho!! I’m not saying it.. Have a Merry weekend! I don’t think it’s ever too soon to start buying awesome Christmas decorations. I’ve started sewing some of my own which will be up on my blog around late November time. I personally believe it is better to be prepared sooner rather than rush things later. Oh my goodness… in the early 1970s I took ceramic classes with my Mom and sister, and the one thing we each did was one of these trees. My Mom made the largest one available in ceramics then with a second bottom branch. I made one like the one you bought and so did my sister. When I divorced, I thought I had packed the tree (as I was moving to a different state). And to my horror? I FORGOT IT. I had that tree for almost 30 years!!! So sad!!!! My mom did even did ones for my grandmothers for christmas gifts – wish I had those too – she did it in white! I had several from my mother. I painted them White and Silver and added them to my Holiday Tree Collection. Love them since they belonged to my mom but they now go so well with my Christmas décor!! !